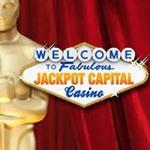 NICOSIA, CYPRUS, January 23, 2013 – Jackpot Capital Casino is throwing an Oscars Party and giving away $175,000 in casino bonuses. Every week top scoreboard players will divide $30,000 in Oscar Bonuses. As the stars and starlets compete for top honors in Hollywood, Jackpot Capital Casino players will be racing against each other up the Oscars Scoreboard for some of the $175,000 in ‘Oscar Bonus’ casino bonus money the star-studded casino is giving away. Every week until, February 24th, $30,000 in casino bonuses will be awarded to Scoreboard leaders. Jackpot Capital players earn Scoreboard points when they bet, deposit and play any of the amazing table games and slots at the online casino. Players can check their Oscars Scoreboard standing any time at http://promotions.jackpotcapital.eu/oscars where rankings are updated daily. Every Monday, players on the scoreboard (winners) will receive a bonus based on individual result/rank of the previous week’s game play. Every Wednesday, another 50 to 100 players will receive a Surprise Wednesday Bonus coupon. General terms and conditions apply; complete contest details are available at JackpotCapital.eu under the Promotions tab. A total of over $175,000 in casino bonuses will be given away before the last Oscar Bonus is awarded. Jackpot Capital Casino is known around the world for its amazing selection of table games and state-of-the-art slots games, and for its no-hassle deposits and withdrawals. Jackpot Capital Online Casino offers over 300 exciting games, including many progressive jackpots such as Caribbean Hold’em, Mid-Life Crisis, Shopping Spree and Light Speed, and hosts slots tournaments played on some of its most popular slot machines. Every casino game comprises state-of-the art graphics and sound to provide a unique gaming experience. Instant-play Flash versions are available for most games. With its variety of deposit options, Jackpot Capital is capable of serving players from all over the world.